I just love cultures where art forms are considered more valuable than gold (let’s tell that to Wall Street). I find it especially interesting when what is considered valuable in non-Western European aesthetics is what has been denigrated in Western art history as “decorative arts.” Gosh, I hate that term – it always conjures up notions that the art form is somehow less valuable or aesthetically worthwhile than “fine arts,” such as painting and sculpture (the old Western Europe/US standard). Fortunately, since the 1970s, fiber arts have become more appreciated in the West as fine art, especially since the feminist art movement of the 1970s. As I’ve said in previous posts, I consider everything ART that is produced by an ARTIST, no matter what medium (and this includes chefs, fashion designers, etc., I could go on and on). In pre-conquest Central and South America, textiles were considered the second greatest commodity after gold. Weaving in pre-conquest American cultures was an art form passed down for mother or grandmother to young women, usually between the ages of seven and eight years. During pre-conquest times, woven material was used as a means of exchange, tribute, payment, and gift. The tradition persists to the present day. 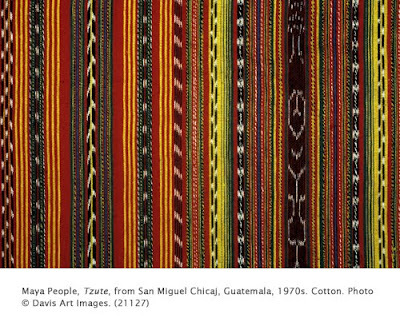 Central and South American textiles are now sold internationally. Weaving is comprised of a warp (the vertical threads) and the weft (the horizontal threads). To this day, traditional weaving in Central America is done on the backstrap loom. It is comprised of several parallel sticks between which the warp threads are stretched. The front rod holding one end is tied to a tree or pole. The back rod holding the other end of the warp is secured to the weaver’s waist with a leather strap wrapped around the body. The common width of the loom, and therefore the cloth produced, is usually 30 inches (76.2 cm). Most large pieces of clothing are made of several lengths of cloth joined together. Tzute is a general word used to refer to a wide variety of square or rectangular utility cloths that are village specific. The cloth is used as basket covers, baby carriers, and carriers for bundles of goods. Pattern often indicates function of the cloth. Tzutes are not only used for carrying but are also worn over the shoulder or folded on the head, according to regional tradition. They are worn by both men and women. The fiber arts of Central and South American aboriginal cultures continue a tradition that is thousands of years old (from c2000 BCE). They pre-date the hey-day of western cultures such as the periods of ancient Greece and Rome (c700 BCE to 5th century CE). From a UK perspective, although textile art is a recognised medium it is not something that is covered on many fine art degree courses and struggles to be accepted on even degree craft courses. So there is still a long way to go before textile art, in any form is fully accepted by the establishment.